Traveling at a slow pace to discover a territory that tries to keep its ancient balance between man and nature, focusing on local development that emphasizes its architectural features and craftsmanship. In the heart of Puglia, the towns of Martina Franca, Locorotondo and Cisternino constitute the last eastern edge of the Murgia, bordering the plain of Salento area. The territory of Alberobello completes the timeless magic of these places with its unique houses, today as yesterday, surrounded by vineyards and olive groves as far as the eye can see. Descending the Murge plateau you will walk in the protected area of the Coastal Dunes Park, reaching the sea and so discovering Ostuni, white village in between hills and plains. Welcome to the city of “Trulli”, the ancient peasant dwellings on which much has been said. The last plausible hypothesis led to think of a link between Alberobello and Harran: in this ancient Turkish city at the border with Syria, typical alveolar houses are strikingly similar to the trulli of Alberobello.To find out more about the history and legends related to the trulli, we recommend a visit to the Museum “Casa Pezzolla”. Today’s walk will head to the South, on country roads and stretches of gently sloping trails. Enjoy the view and the nature of Bosco Selva, a rare example of the vast oak grove that once covered the whole surrounding area. 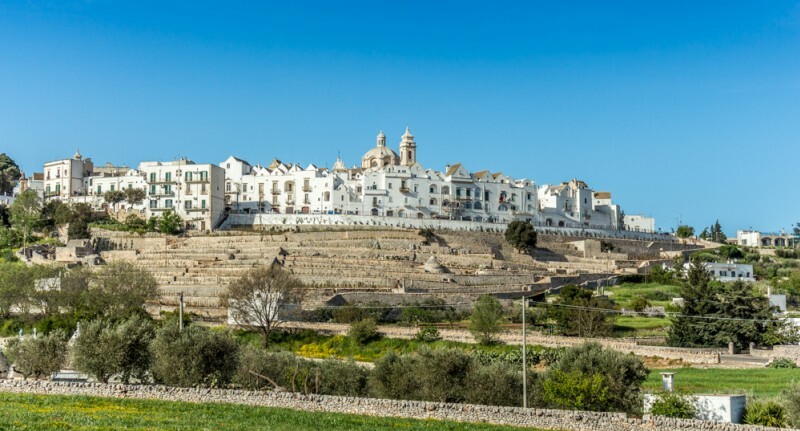 Following direction Martina Franca, among high dry stone walls, typical of this area, and along pasture fields that still preserve ancient trulli, you will go up to Monte San Martino to reach the elegant old town center, vivid example of Puglia Baroque art. Early in the morning, with a short public transfer, you can reach Locorotondo, a village whose name recalls the characteristic shape of its historical center: a set of white houses arranged in concentric rings. Book a visit to the old town and its wine cellars before you get back on the track, now running along the Puglia Aqueduct, the longest in Europe. The last detour will take you to Cisternino, a charming village renowned for the whiteness of its houses and for its “stoves”, reinvented butcher shops, where you can personally choose the meat cuts to be grilled on the spot for you. Before you leave Cisternino, take the time to stroll through its narrow streets, to appreciate the details of the buildings, examples of baroque style and oriental “Renaissance”. The village is the result of a spontaneous settlement, “a great masterpiece of architecture without architects.”Back on the road, climb down the eastern slopes of Valle d’Itria until you get to the Regional Natural Park of the coastal dunes, among the most interesting protected areas of South Italy thanks to its many natural habitats and sites of historical importance. Crossing the agricultural village of Montalbano you will reach its dolmen, a megalithic monument hidden amongst ancient olive trees and once used for esoteric rituals that were quite common between the ancient inhabitants of this land.A few kilometers on the Via Traiana, a stretch of the ancient roman road connecting Benevento to Brindisi, and you will get to the farm where you will spend the next two nights. You will need a full day to discover this Park and its many beauties.A loop trail brings you amongst thousands-year-old olive trees, to have a close look to fossil dunes, witnesses of the sea-level shift occurred over the millennia.Cross endless pastures framed by the famous “lame”, canyons hiding ancient caves; between the fossil dunes and the new ones, you will find the wetland of the River Morelli, characterized by the presence of some fresh water where eel fishing was practiced since the nineteenth century. The way back to the farm will be on the same gravel roads, leaving the sea behind and continuing towards the imposing massif of the Murgia. Leaving the farm, you will at first walk in the countryside where tasty products that end up on the dinner tables of typical restaurants you might want to sit at are grown. Then you shall come up the “mountains” by carefully choosing your path: through the forest, climb slowly towards the ancient village “La Terra (The Earth)“, the highest and most characteristic hill of Ostuni. If you like, you can also try a detour to the Sanctuary of San Biagio, the most complete rocky settlement of Ostuni. When, among the olive trees, you will get to see the white inverted cone of Ostuni, then you will be near the “Archaeological Park of Santa Maria di Agnano”, a site of exceptional historical value where a young woman of the Paleolithic era was found. After breakfast a short trail, mainly on gravel roads downhill towards the sea will take you back to the Natural Park Coastal Dunes. This protected area between Ostuni and Fasano, with its numerous natural habitats, the ancient olive groves, the historic masseria farms and underground oil-mills, develops an important role in the environmental protection and relevant sustainable economic development. Reaching an ancient farmhouse you can taste real extra virgin olive oil, visit the underground oil mill supposedly dating back to Roman times, the private museum, the small church from the 18th century with its altar made of local stone of Lecce, the olive trees now waiting for international recognition through a possible future inscription in the Unesco World Heritage list. The way back to Ostuni follows the same short trail. After breakfast, end of services.If you still have time, we recommend to stroll randomly through the maze of winding streets in the old town, looking for a souvenir of your stay, maybe a tool made out of olive wood, crafted by the strong hands of patient artisans.